Welcome to New York City and the Second Great Depression. Everywhere you look, there is death, destruction and drugs. Crime is rampant and an underground party circuit has evolved to sate the needs of the depressed citizens. Enter the NYPD’s CAB unit – the Citywide Anticrime Bureau. But will a handful of detectives in beat up old taxicabs be enough to save the city from the influx of drugs and crime lords? It’s up to Detective Sixto Santiago and his partner Everett More to find out. Rivers of Gold is filled with some of the oddest and most interesting characters I’ve read in a long time. Renny is a fashion photographer by day, drug runner by night. If he can keep making enough money selling drugs at night, he can continue his leisurely quest to shoot the photos he likes, when he likes. For me, his voice is the prominent one, although equal time is given between himself and Detective Santiago. While Renny was sometimes hard to like – he can be a bit of a womanizer – I liked Santiago almost from the start. He had a rough childhood but didn’t let it hold him back nor did he let him lead him down the wrong path. He’s constantly conflicted when it comes to his job because his new partner continually crosses the line between what he thinks a cop should and shouldn’t do. Everett More, Santiago’s partner, is like nothing I’ve ever read before. Even after having finished the book, I’m not sure whether I like him or not. He was over the top, a little scary and downright odd from the moment you meet him. Something that nagged at me in regards to the series is that they’re referred to as the More series and yet, More’s point of view isn’t one you get to see at all during the novel. It isn’t something that will detract from your enjoyment, but it did make me scratch my head at times. 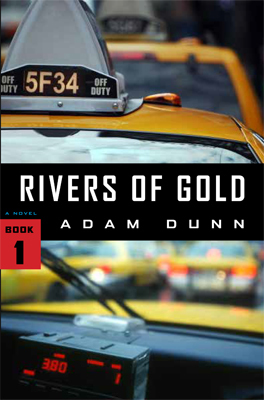 Rivers of Gold was an interesting twist on your usual police procedural. Taking us to a New York that never existed and giving us a brigade of cops in cabs only added to the uniqueness. My biggest issue with this series was the endless paragraphs detailing makes and models of cars and weapons and other things. While detail is very important, too much can be overkill and has a tendency to kick me out of the story, no matter how much I’m enjoying it. In addition, once Santiago begins to wonder about More, you begin to wonder about him, too. Finding out his secrets becomes almost as important as finding out who’s supplying the drugs to Renny. Despite the sometimes overload of detail, the story is gripping and engaging.